Cross-validation is a technique used to measure and evaluate machine learning models performance. During training we create a number of partitions of the training set and train/test on different subsets of those partitions. Cross-validation is frequently used to train, measure and finally select a machine learning model for a given dataset because it helps assess how the results of a model will generalize to an independent data set in practice. Most importantly, cross-validation has been shown to produce models with lower bias than other methods. This tutorial will focus on one variant of cross-validation named k-fold cross-validation. Cross-validation is a resampling technique used to evaluate machine learning models on a limited data set. The most common use of cross-validation is the k-fold cross-validation method. Our training set is split into K partitions, the model is trained on K-1 partitions and the test error is predicted and computed on the Kth partition. This is repeated for each unique group and the test errors are averaged across. Cross-validation is commonly used since it’s easy to interpret and since it generally results in a less biased or less optimistic estimates of the model performance than other methods, such as a simple train/test split. One of the biggest downsides in using cross-validation is the increased training time as we are essentially training K times instead of 1. Now let’s train an end-to-end example using scikit-learn and Comet.ml. This example trains a text classifier on the news groups dataset (you can find it here). Given a piece of text (string), the model classifies it to one of the following classes: “atheism”,”christian”,”computer graphics”, “medicine”. The following chart was automatically generated by Comet.ml. 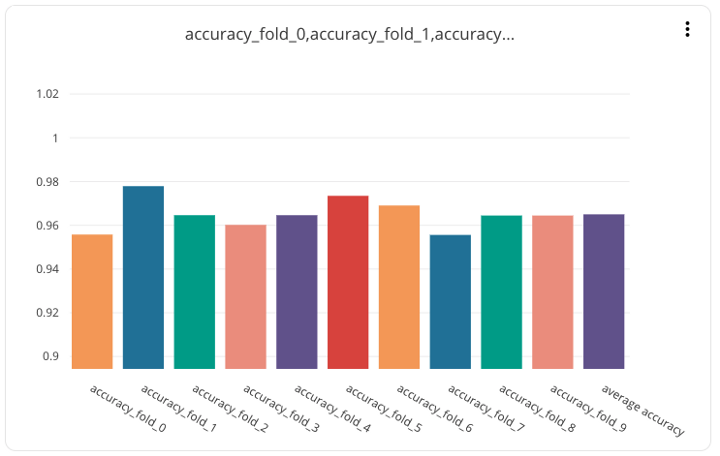 The right most bar (in purple) represents the average accuracy across folds. As you can see some folds preform significantly better than the average and shows how important k-fold cross validation is. You might have noticed that we didn’t compute the test accuracy. The test set should not be used in any way until you’re completely finished with all experimentation. If we change hyperparameters or model types based on the test accuracy we’re essentially over-fitting our hyperparameters to the test distribution. Found this article useful? Follow us (Comet.ml) on Medium and check out some other relevant articles below! Please 👏 this article to share it! Comet.ml Release Notes — updated daily with new features and fixes! Bio: Gideon Mendels is Co-Founder and CEO @ Comet.ml. Comet.ml is doing for ML what Github did for code. Our lightweight SDK enables data science teams to automatically track their datasets, code changes, experimentation history. This way, data scientists can easily reproduce their models and collaborate on model iteration amongst their team!